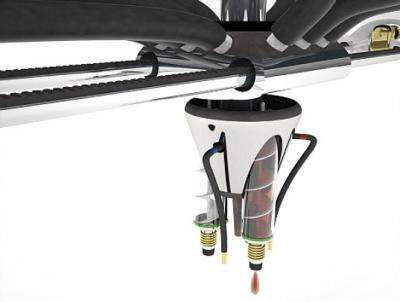 (PhysOrg.com) -- US scientists have introduced a concept design of the "Cornucopia" or Digital Fabricator, a "personal food factory" able to print food from specified ingredients, with no waste at the point of cooking. 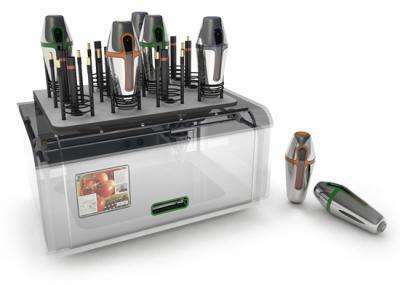 The food printer is at the concept design stage, and would work by storing and refrigerating ingredients and then mixing them, cooking layers of the mixture and printing them onto a serving tray. The concept design was introduced by two graduate students at the Massachusetts Institute of Technology (MIT) Fluid Interfaces Group Media Lab: designer/engineer in algorithmic image process development Amit Zoran, and designer and research assistant Marcelo Coelho. The food printing process begins with selecting the required food canisters in which ingredients are stored and kept refrigerated. Ingredients are then fed into a mixing chamber and the mixture is extruded and deposited in layers of various and complex combinations of ingredients. During deposition of the layers onto the serving tray the ingredients are either cooked or cooled in the chamber or by heating/cooling tubes attached to the printing head. The researchers say the printing process brings cooking technologies into the digital age and allows entirely novel textures and flavors to be created that would otherwise be unimaginable and which are unobtainable through traditional cooking techniques. They say users would be able to control the nutritional value, quality and flavors in each meal through a touch-screen interface and Internet connectivity, which would allow them to manipulate parameters such as carbohydrate or fat content and calories. The design also allows for the food printer to be able to automatically order new ingredients and suggest an alternative ingredient if one runs out. 3D printers already exist (see, for example, PhysOrg’s article on 3D printers for moon bases and the affordable desk top 3D printer). The printers are becoming more common and are already being used in applications such as creating three-dimensional prototypes or models. The researchers hope their concept will "provide a glimpse at the new aesthetic and cultural possibilities, which can be brought forth by a new, digital gastronomy." What makes a meal tasty? So, integrate a refrigerator, a mixer, an oven and automate the cooking process. Doesn't sound like much but could be the base of an interesting kind of technology. Just another one of those things that can be done but probably shouldn't. The best use would be mixed drinks. Four containers for liquor and eight for juices or mixes and you got your self a party. Just think of the artistic aspects. You could program it to make an perfect, edible, replica of the Mona Lisa, or even a 3-D pizza that looks exactly like your own face. Gives a whole new meaning to "Eat me". Well, if we think ahead: current stereolitography processes (which is basically where this is derived from) can go down to tenth of a millimeter. So making something that is 'structured' to simulate e.g. a piece of meat could be possible. It's an interesting technology and should be looked into. If we can make soy taste like meat (sort of) we can make anything taste like meat. Better idea, come back when you just need to plug in containers of the base elements required to make the item. lol because I thought of the same quote. There isn't any reason that you couldn't load it with a real steak cartridge or premade cookie dough. You could have real ice cream and all kinds of toppings. I think it's brilliant. 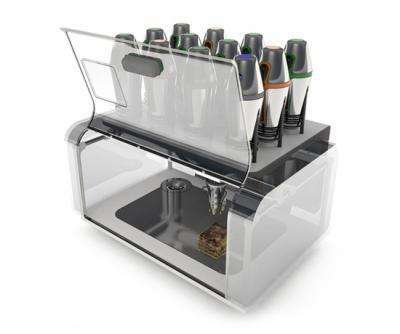 The drink robot application mentioned above would be grand too. Imagine an ice cream shop at the mall with no employees. Someone just changes out the cartridges once or twice a week and people could pay with a bank card. The article says that it can manage its own inventory and re-order supplies. That sounds awesome!! I'm not sure where you are all getting the idea that it has to be loaded with paste. Why could you not use real food? Sauces, diced vegetables, fresh spices and herbs to be ground on order. You could really do some neat stuff here. I want to use it to make cakes. My kids want the strangest contraptions. Come to think of it, I should start with a real cake, get the machine to precision cut it, and put ideally colored and built up icing on it. That would be cool, and I'd be prepared to trust the machine with cutting and with colored icing. The chicken flavor dispenser cracked and leaked, so now everything tastes like chicken. I think chefs and bakers may find very interesting uses for this type of technology. It could easily create pictures on cakes. Or pictures with ice cream, or pizza. I foresee it being used in commercial food production. News flash: pictures printed on cakes in edible icing have been around for half a decade. My previous post was removed as it was deemed pointless verbiage. I take exception to that- it was meant as a pertinent and heartfelt nod to Star Trek, which has been a powerful influence and inspiration to two generations of scientists and engineers. I am sure if you asked them, the young engineers who came up with this devise would undoubtedly say that they were in some degree inspired by the food replicator on the Enterprise. horribly processed containers of "food ingredient". Dog food anyone? It can make dog food taste good! Soylent green, yum, yum! Apparently moderators pick and choose what they delete arbitrarily. They delete great pop culture references and allow idiotic comments by creationists on every article pertaining to evolution. This is replicator 1.0. Hopefully they will get it to the point where it builds it from the molecular level and not ingredients. Interesting idea and I agree it seems very Star Trekkie. Although I do see immediate applications for space travel, I think this gizmo, once perfected would have great potential for medical use. As a diabetic I would love to be able to just program a machine for the proper carb/protein/calorie ratio for my meals. It would be great. The time consuming, mind numbing juggling of numbers related to our diets would be a thing of the past, allowing us to live fuller, healthier, less stressful lives. Thank you MIT guys.